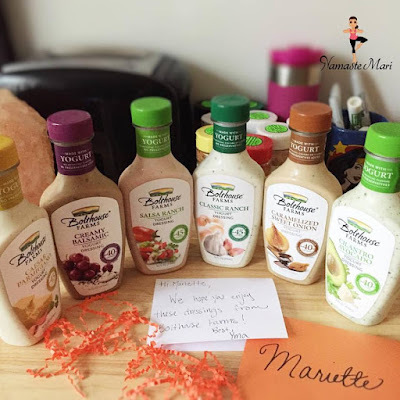 Namaste Mari: Monday Morning Rambles…I Am Obsessed with Bolthouse Farms Dressing! Monday Morning Rambles…I Am Obsessed with Bolthouse Farms Dressing! Good morning my loves! I hope you guys had a wonderful weekend. My weekend consisted of finding my truth, taking progress photos, and enjoying some delicious dressing! The amazing people over at Bolthouse Farms sent me a box of goodies and I’ve been trying them all weekend. I’ve been a fan of their dressings for some time so I couldn’t wait to try their new flavors like Caramelized Sweet Onion and Creamy Balsamic! I am a tad obsessed with the Caramelized Sweet Onion…it sort of reminds of French onion dip!!!! Oh and Salsa Ranch is so damn good. This is like “Sophie’s Choice” ha! I can’t pick my fave. And dare I say it, that I even liked the Cilantro Avocado flavor which is huge because I hate cilantro. If you are a cilantro fan; I guarantee that you will love this one. If you guys are looking for flavorful low calorie dressing that doesn’t contain any artificial coloring and preservatives…check these out. Also, don’t look for them in the salad aisle…since they aren’t filled with junk; they are kept nice and cold with the salads. Today I kicked off Month Three of the Oxygen Magazine Challenge and I love the new workouts and meal plan. This month we begin carb cycling which I already do but this month it will be much more intense. Also, I took my progress photos over the weekend and I am so damn proud of myself. Sometimes we are so focused on the scale that we miss the other changes in our body. The weight is s l o w l y coming off which any other another time would have upset me but not this time! I am getting stronger…physically and mentally. Check out my vlog below where I review all the flavors and also share my truth!